stranded when stranded, no worry more. voltage and over-charge. Much better and more durable than others. 【PORTABLE & BETTER ON LOOK AND FEEL】 Fascinating Black color, it' more endurable and will not fade, the shell finished with elegant lines is easy to be held in single hand, and the shell refined through sand blashing process looks better and has better feel, won't stand much your room for placing, It's enough to store in the box. 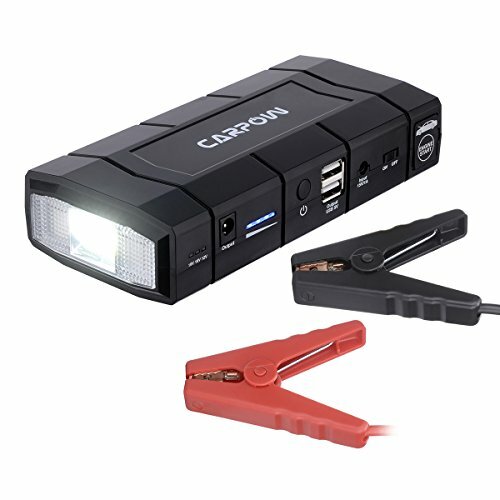 【Gained Certification Authority】 Carpow jump starter It has passed international authoritative organization certification, such as FCC, CE, RoHs, etc. 【MORE SAFETY】Adopting and built-in high quality Smart protection system and Smart Power Control Processor for preventing from short circuit, the jump cable provides multiple security protection for short circuit, over charge, over current, over discharge, balance-charge as well as reverse connection. 【POWERFUL LED EMERGENCY LIGHT & MEASUREMENT FUNTION】 No matter you need light to change a tire, inspect an engine, or need to warn oncoming traffic that you are broken down on the side of the road, oThis 4 LED lighting pattern (blaze, SOS/Flash, Alarm ), will be your necessary tool helper. Don't forget there's measurement function on the right side When you need to measure the depth of tire tread of something else for your reference. If you have any questions about this product by Carpow, contact us by completing and submitting the form below. If you are looking for a specif part number, please include it with your message.